Hummingbirds can’t pass up the deliciously rich colored flowers on these vines and other birds are attracted to the berries that some of them produce. They grow rapidly on fences, arbors and trellises but can also make a nice ground cover. 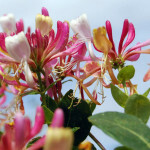 Honeysuckle does well in most any well-drained soil, especially when fertilized three times during the growing season. They can take full sun to partial shade and need only moderate watering. 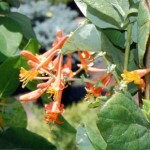 Hall’s Honeysuckle — shown in photo above — Lonicera japonica ‘Halliana’— a vigorous twining vine with rich green foliage that will easily cover a large area in a short period of time. 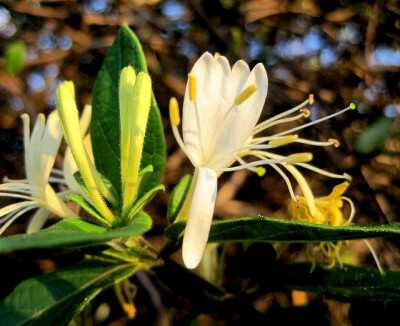 Fragrant yellow and white flowers are produced in early summer. Matures at 15 to 30 feet. Berries Jubilee® Woodbine Honeysuckle — Lonicera periclymenum ‘Monul’ — a fast-growing vine with twining woody stems up to 15 feet long. Spectacular color from fragrant white to yellow flowers followed by a profusion of bright red berries. 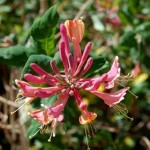 Goldflame Honeysuckle — Lonicera heckrottii ‘Goldflame’ — has purple to deep pink buds that open to golden yellow tubular flower that are bright pink outside. Fast growth to 15 feet. 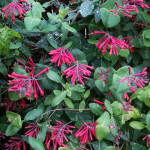 Trumpet Honeysuckle — Lonicera sempervirens ‘Magnifica’ — Hummingbirds love the trumpet-shaped showy scarlet flowers. Fast growth with stems to 10 to 20 feet long. Mandarin Honeysuckle — Lonicera ‘Mandarin’ — Tubular mandarin orange-red flowers with pale orange interior. Twining habit quickly cloaks shade arbors, old trees and woven wire fences. 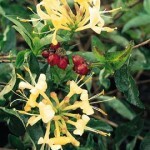 Winchester Honeysuckle — Lonicera periclymenum ‘Winchester’ — Fragrant cream and maroon-purple flowers. New leaves emerge as rich purple and mature to dark green. Fast growth to 15 or 20 feet. 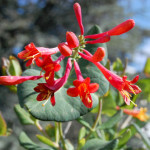 Dropmore Scarlet Trumpet Honeysuckle — Lonicera brownii ‘Dropmore Scarlet’ — Features a long blooming season of tubular flower clusters backed with blue-green foliage. Red berries follow the blooms. Fast growing stems 10 to 20 feet long by 10 feet wide. 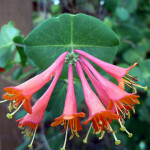 Major Wheeler Honeysuckle — Lonicera sempervirens Major Wheeler — This vine’s profuse blooms of coral color flowers are particularly popular with hummingbirds.